A new version of ELAN, the widely used tool for time-aligned annotation of linguistic data, was released today by the developers, Han Sloetjes and Aarthy Somasundaram. One of its major features is a whole new user interface for high-speed transcription. This interface is the outcome of a process of user consultation and usability testing at the MPI for Psycholinguistics led by Mark Dingemanse, Jeremy Hammond, and Simeon Floyd in close collaboration with the ELAN developers Han Sloetjes and Aarthy Somasundaram. In this post we outline the most important features of Transcription mode. Transcription Mode is a mode designed to increase the speed and efficiency of transcription work. The interface is keyboard-driven and minimizes UI actions. All annotations of a certain tier type are displayed in a vertical list for easy visual access. Transcription mode brings down the transcription work to the bare essentials: listen, type, listen, type, listen, type. Note. Transcription mode presupposes that the initial segmentation of the recording is already done. 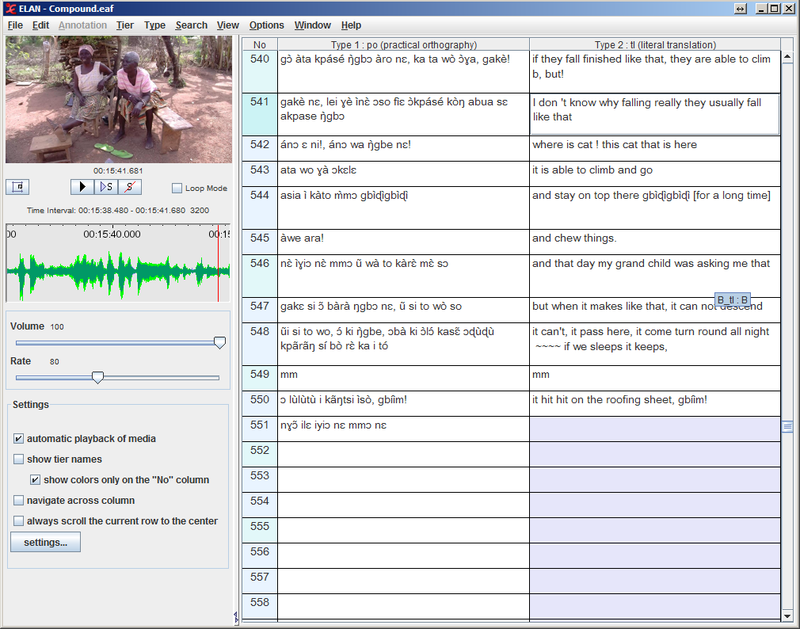 The rationale for this is that the most efficient workflow for transcribing large amounts of linguistic data is a two-step process: first segmenting the recording into turns —also attributing turns to the appropriate speaker— (this can be done in Annotation mode or in the special purpose Segmentation mode), and then transcribing and translating these turns. You can reach Transcription mode via the Options > Transcription mode menu. If you go to Transcription mode for the first time, a Settings dialog will come up. Here you can select the tier types to be used for up to three columns. Note that you select tier types, not individual tiers. This is because Transcription mode displays all annotations on all tiers of a certain type in a vertical column. In our example, we choose the type po (practical orthography) as the first column. We can leave it at that if we just want to work on the transcript. Or we can display up to two additional columns next to the primary one. In our example, we’ll add the literal translation type. For the second and third columns we can only select tier types that are time-aligned with the first using the stereotype “Symbolic Assocation”. In our example, we can select tl (literal translation) and/or tf (free translation) as second and third columns. We cannot choose the tier type vb (visible behaviour) here, because it is not time-aligned with our primary column. Having selected the tier types we want, we click “Apply”. Now the chosen tier types are displayed in vertical columns, and the two largest differences from the default Annotation mode become visible: (i) all annotations are displayed vertically (top to bottom) rather than horizontally (left to right), and (ii) columns display all annotations of a certain type. For instance, the po (practical orthography) column displays turns from both speakers A and B. Note. Transcription mode presupposes that you use linguistic types to differentiate the types of information in your tiers. Thus the linguistic type of your free translation tier should be different from the linguistic type of your main transcription. This is necessary for any serious corpus work anyway — for instance, ELAN’s multiple layer search also relies on this. If you haven’t been using linguistic types yet, consider investing the time to bring your files up to speed. This will not only let you use Transcription mode, it will also allow complex corpus searches and in general make your data more structured. The best way to enforce proper use of linguistic types across your files is to use a template. Transcription mode is built for high-speed transcription work. It plays automatically so that you can start typing right away. You can hit TAB to replay, and if you finish typing you hit ENTER, which brings you to the next annotation, which is played automatically so that you can start typing right away… and so on. Transcription mode boils down the transcription process to the two most essential actions: listening and typing. Once you’ve set it up, you don’t need to worry about anything else. You can use Transcription mode to do initial transcription of a segmented recording. For this you would use the simplest, one-column setup. You can also use it to work on translations if you already have transcriptions. For this you would display both tier types side by side. And of course you can do the transcription and translation work in one go. For this you would use the two-column setup and check the option to “Navigate across columns”. The basic philosophy of Transcription mode is to make things as easy as possible for the transcriber. This is why it displays annotations in a table rather than on a timeline, plays automatically on selection, and moves to the next annotation without requiring additional clicks or key presses. It will also silently create child annotations if they don’t exist yet — merely clicking an empty cell (or moving there using the keyboard) creates an annotation and opens it for immediate editing. The user just has to make sure the relevant tiers exist for all participants, and Transcription mode takes care of the rest. TAB plays the current annotation. It acts as a play/pause key, so you can press it again to pause playback, and again to continue playing. SHIFT+TAB plays back the current annotation from the start. UP and DOWN arrows move up and down within a column. Remember that ENTER automatically moves to the next annotation. The Navigate across columns setting controls whether you go down within a column or you move across columns (from left to right). Clicking on any annotation activates it for editing. The cursor will be placed close to where you clicked and you edit right away. You can also use the mouse to select part of the waveform for playback. TAB will play/pause the selection. Right click on annotation will give you an option to jump to the Annotation mode. This will allow you to finely manipulate annotation boundaries and then return to Transcription mode. screen layout. This option determines whether the media and settings are displayed on the left side or on the right side of the screen. Clicking it flips the screen layout. Default: video, audio and settings on the left. loop mode. This option is found to the right of the play/pause buttons. When checked it means that a selected annotation while constantly loop until a new annotation is selected. Default: unchecked. Below the waveform your find a couple further options that you can use to customize the Transcription mode experience. automatic playback of media. This controls whether the annotation is automatically played or not when you arrive at it. Default: checked. show tier names. This controls whether tier names are shown within the list or not. If unchecked, colour coding distinguishes different tiers/participants, and hovering over an annotation will tell you the tier/participant name. (There is an additional choice to show colours in the cells themselves or only in the line number column.) Default: checked. navigate across columns. This controls what annotation you move to after hitting Enter. If unchecked, you move only within a column (from top to bottom). If checked, you move across columns (from left to right). Default: unchecked. always scroll the current annotation to the center. This mode keeps your current annotation always in the middle of the screen. Default: unchecked. The layout of the transcription mode is designed to replicate the best aspects of a word processor and a spreadsheet – all the while allowing you access to the time-aligned video and audio signals. The video column, which also includes the options and wav form, can be placed on the right or left. Press the screen layout button to toggle the video/settings column from left to right. The video can also be detached for viewing independent of the main window, for instance on a secondary monitor. All of the columns are resizable: just mouse click and drag the boundaries to fit your desired widths. You can order columns as you please. So once you have established your types you can then reorder them on the screen simply by dragging them to the desired location. You can zoom in on the video signal in order to focus a particular part (also available in annotation mode). This works best with HD footage. Font size of the columns is variable: you can change this in the settings dialog box. We hope you enjoy this addition to the Elan toolset. It is designed to cut down on the many hours it takes to do detailed transcriptions and we feel that you will find it an indispensable part of your workflow. This entry was posted in Fieldwork, Linguistics, Software by mark. Bookmark the permalink.